We at Special Nutrients are proud to announce that we have just completed the newly updated and revised 2nd Edition of Mycotoxins and Mycotoxicosis in Animals and Humans. This new Edition is now available in electronic form. Please click on the link below and complete that questionnaire to receive your copy. In order to send you a free copy of our mycotoxin manual, CLICK HERE. Alberto Gimeno and Maria Ligia Martins published in 2003 a mycotoxins manual in Spanish entitled Micotoxinas y Micotoxicosis en Animales y Humanos. The third edition of the Spanish manual was published in 2011. 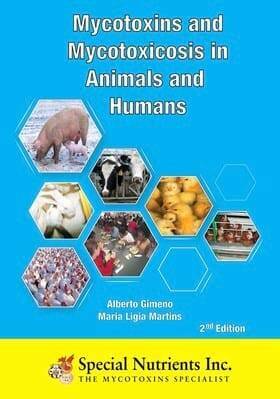 The same manual was then published in English in 2006, entitled Mycotoxins and Mycotoxicosis in Animals and Humans. This manual is a review and an update of the Spanish version, especially on the subject of mycotoxins legislation. The manual describes the mycotoxins problems produced by aflatoxins, ochratoxin A, zearalenone, vomitoxin or deoxynivalenol, fumonisins, patulin, T-2 toxin, diacetoxyscirpenol, monoacetoxyscirpenol, triacetoxyscirpenol and scirpentriol in animals (poultry, pigs, rabbits and ruminants) and some of them in humans. Mycotoxins concentration producing serious effects, synergisms and/or associations among mycotoxins, as well as, contamination occurrences are reported in the manual. Several recommendations to reduce mycotoxicosis; and strategies for prevention, decontamination, detoxification, and inactivation are discussed. Maximum tolerable mycotoxins concentrations and the current European Union legislation are also described. The manual is a consulting book for the professionals in the area of animal and human nutrition, for field veterinarians, farmers, and for the general public interested on this matter. For more information about the manual, contact (in Spanish or English) Mr. Fernando Tamames III from SPECIAL NUTRIENTS, 2766 Douglas Road, Miami, Florida 33133 USA. NOTICE! If you are asking for the handbook, please check carefully that your personal data is correct to avoid any mistake in the sending of the copy. Thank you.